The Rural Manager’s Association (RMAX) of Xavier Institute of Management organised Gramotsava’14, its flagship event from the 16th-18th October. A rural marketing fair, Gramotsava is conducted every which intends to bring leading corporate brands closer to the rural hinterlands. Gramotsava has its roots in 2006 when it was started by exploring the opportunities in rural areas. This year the yearly fair was organised in association with some of the most esteemed corporate and social entities; Mahindra two-wheelers, KGVK, OKVIB, Spring Health, etc. Other partners included Indian Farmers Fertiliser Cooperative Limited (IFFCO), Pragati Handicrafts, BIG 92.7 FM, Goonj (Merchandise partner), Spring tide (Online partner) and OKVIB. Experts state that the coming decades will see growth and prosperity in India driven primarily by the confluence of both the urban and the rural sector. But prosperity and growth are incomplete without improvement in cleanliness and sanitation, which forms an integral part of developed as well as developing countries. This year Gramotsava aimed at giving special impetus to sanitation. Sanitation and cleanliness are crucial issues which our respected Prime Minister Narendra Modi also recognises and hence, launched a cleanliness drive this year, called ‘Swachh Bharat Abhiyan’ which aims to clean India by 2019. Its foundation has been laid down on the Gandhian vision a cleaner India. 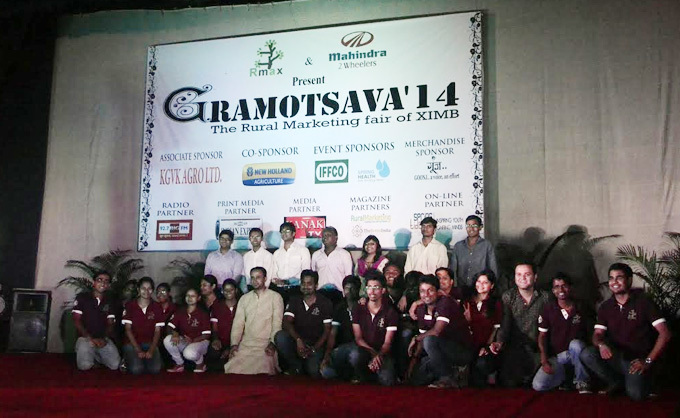 Gramotsava’14 was organized at the Gop, situated in the Puri District, 54 km from Bhubaneshwar. The mascot of the fair, an Olive Ridley Turtle, called Bonnie Bhaina, stood as the symbol of peace, longevity and stability across all cultures. Through the mascot the institute intended to promote not just the culture of the state but the will with which the villages which rise back resurgent to all calamities. These learning were also useful for the children participating. Students accept the fact that learning from Gramotsava is a lifetime experience and it is spiced up by the slew of activities that they are involved in and that this knowledge remains till the end. Overall the event was a success and saw active participation. Xavier University, Bhubaneswar (XUB) was established in accordance to Xavier University Act 2013 and was inaugurated on 7th of July 2014. The University is India’s first digital University and an institution of higher learning for imparting professional and technical education. "Xavier University" is dedicated to research & teaching that meets the highest standards of excellence; to conducting research that breaks new ground; and to providing services and solutions that help individuals and the local, national, and global communities. XUB, an autonomous institution is one of the prestigious institutes of the country. XIMB the business school, which was founded 27 years back through a social contract between the Odisha Jesuit Society and the Government of Odisha, is the flagship school of XUB. Since its inception in 1987, Institute has been offering quality management education with a human face. XUB also offers its masters in Human Resources through Xavier School of Human Reource Management, Rural Management through Xavier School of Rural Management and graduate programme in commerce through Xavier School of Commerce. XUB always promotes a holistic development of the society and upliftment of the lives of people and this X-Athon bears ample testimony to this fact.